There is an unwritten rule or trend among serious ballet schools to assiduously avoid calling their recitals “recitals.” Rather, everyone now is employing the term “performance.” I think this comes from the sometimes deserved reputation of traditional recitals and the images that come to mind of them — little girls standing around not really knowing their dances all that well, holding and sucking on their hair (that should have been pulled neatly back and up off of their faces), and occasionally scratching in embarrassing parts of the anatomy, while moving around in a group, tattered and not together, while the ever-hopeful teacher in in the wings visibly gestures frantically to her young charges in hopes that an instant Vulcan mind-meld just might work at that very needed moment (and this, sometimes sadly, of the advanced ballet class. ); stoic dads; fierce moms who elbow their way to the “best” seats; flash bulbs; recitals that stretch on seemingly for days…. No, not at all so for Oregon Ballet Theatre’s School’s Annual Performance. I’ve not been able to see their work in the past but this round I was able to catch both an OBT Company show the night before and the school performance the following afternoon. Lured by curiosity, as well as wanting to support and, hopefully, enjoy the performance, I was delighted and treated to a full, yet relaxed in feeling, two hours (including two intermissions) of professional-level trained students and their dancing. Smartly opening the show (the entire School was in the last piece of the program — smart because families get restless and tend to leave the second their young charmer is done, thereby missing out on the benefits that come from seeing the whole show, and the audience is diminished), was Balanchine’s 1980 piece, Walpurgisnacht Ballet from Gounod’s Faust. Oh, how this ballet makes me realize how much I miss and cherish ballets by this great choreographer. 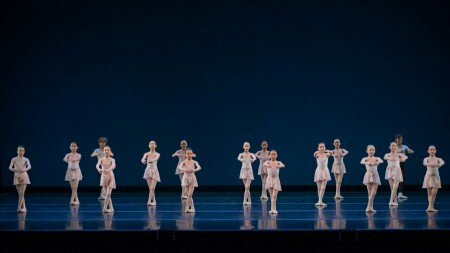 While this one is more of a piece d’occasion, even a minor Balanchine work is a major hit in my book. His seeming ease of construct, use of many, ever-evolving patterns, and use of all levels of the traditional ballet hierarchy are inspired and appear freshly made, no expiration date. The students more than rose to the challenge and appeared to be enjoying themselves throughout. Balanchine often throws in very technically hard/ challenging steps and motifs, yet they made it all seem easy. 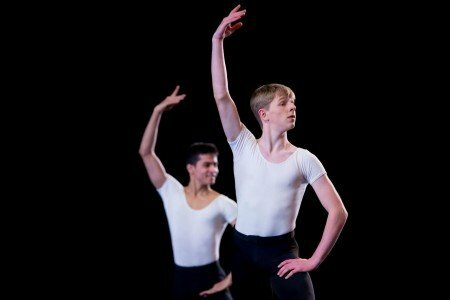 Technical and acting ease hallmarked the dancing of Finnian Carmeci, who starred as A Young Benjamin Britten in A Great Britten, effectively co-choreographed by School Director Anthony Jones and Alison Roper, set to Britten’s Young Person’s Guide to the Orchestra. 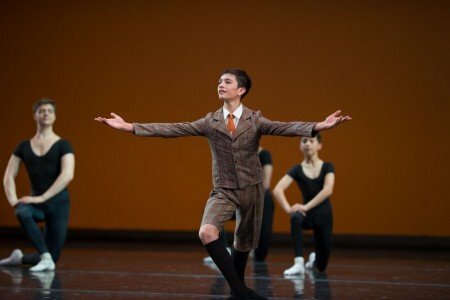 This ballet perfectly showcased its School students by following the outline and program of the score, introducing each section and type of musical instrument of a symphonic orchestra. The work is so strong, that it should be considered for OBT’s main stage, as it is filled with “dancy” phrases and verve throughout. 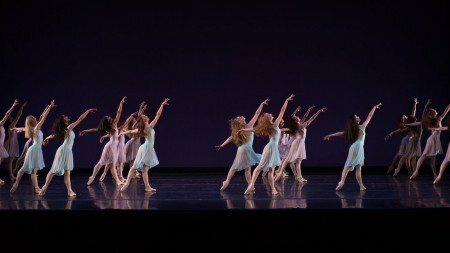 Debussy’s Claire de Lune is one of the world’s favorite piano tunes — and one that I was drawn to use for choreography myself. Lyric, tuneful, poetic and unworldly, the excerpt from Nicolo Fonte’s Beasts illustrated just that — an expression of the profound. Talented male student Daniel Salinas was surrounded by 10 females and was finally subsumed into their line of beauty. An exciting Gala-type duet, The Flames of Paris, also was a showcase– this time for Elizabeth Kanning and her dance partner Alessandro Angelini. Both were comfortable in their respective assignments and seemed happy to be dancing it. Sometimes you can see and sense an underlying fear or tentativeness when dancers have to tackle technically difficult work, but not at all the case here. Each danced with comfortable aplomb. The Paris Opera Ballet has long done a showcase that brings out its entire and huge ballet heirarchy to the stage, a “Défilé.” Everyone from the youngest and most beginning students, to the Company stars comes out and does a bit, and then the whole gang poses for a grand finale. I got to see them do this in their historic Garnier Palace home theatre in 1975, and it’s both impressive and amazing. OBT School teachers Jones, Natasha Bar, Elise Legere, Kembe Staley and Lisa Sundstrom put together something similar that brought out all of its School levels, beginning with the Level 1A up through Levels 5 and 6, including the men of the School. Each had a short classroom-like dance to do and all concluded onstage in a Finale. Grand Étude was a swell way to conclude a fun and exhilarating (and refreshing) afternoon at the ballet. I was so glad to have attended, rewarded by observing nicely and correctly trained students and enjoying happy dancing.